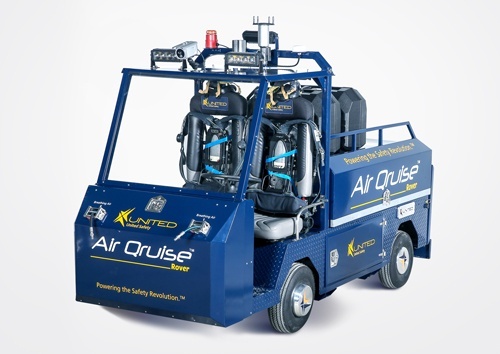 The Air Qruise™ Rover is a combination of cutting–edge technology tempered with decades of experience in the Immediately Dangerous to Life and Health (IDLH) environment. The Air Qruise™ Rover is a unique concept vehicle. It is air-powered and designed to operate safely and reliably in potentially toxic and explosive atmospheres. The Rover has the ability to supply its occupants with sufficient breathing air to reach remote worksites. Equipped with the latest in environmental monitoring, it can track a multitude of sensor inputs including wind speed, wind direction, GPS location, toxic gas levels, full color images and vehicle health and operator biometrics. Information can be reported through one of many redundant links to offsite facilities where it can be monitored and analyzed. Air Qruise™ Rover. Working and traveling through a red zone just got the green light.